How effective is the detection technology? How compelling are the implemented controls? How reliable and durable is the system? Through a process of incremental improvement over its 45 year history Argus has what we believe to be the most effective spark detection technology available for relevant applications. 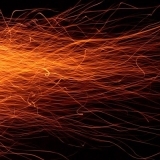 Effective with a broad range of spark hazards, detecting sparks as small as 2 millimeters. Reduces the cost, production disruption, and waste caused by “False Positive” system release. Through a patented process Argus detectors actively filter out light sources that are not hazardous. Other systems do not, causing unnecessary expense for the mill and reducing employee confidence in the system. 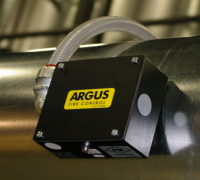 Argus detectors identify the hazard and then feed the process that initiates the controls process (releasing suppression agents, shutting down relevant production components, and signaling the incident) all in less than 50 milliseconds. No suppression system is faster and traditional systems are dramatically slower. This high speed response is required in order to combine reliable detection with effective system processing and to better ensure process safety with low-cost, effective plant operations. As an added benefit, this high-speed detection and response capability allows Argus process protection systems to be retro-fitted into more restricted production layouts than competing systems. All detectors are “burned-in” for a minimum of 72 hours and are “live” tested with active embers in ductwork. All detector lenses are tested to ensure effective production and installation. We periodically sand-blast lenses to simulate years of use in harsh environments and to ensure long production life. Detector components are installed in dust-tight steel housings appropriate for industrial use. With more than 100,000 detectors installed in production facilities around the world, Argus spark detection should be the heart of YOUR industrial process protection system. Combining the ability to focus on infrared bandwidth specific to embers, broad field of view, and extraordinary sensitivity, the Argus Spark Detector is relied on world-wide for safe, consistent, and effective protection. Argus employees and agents attend a broad range of exhibitions and trade shows world-wide. Please meet with us at any of the shows on the schedule noted below. All rights reserved. Argus Fire Control, Inc..